A vacation in the Canadian Niagara Falls area promises breathtaking scenery and diverse activities from relaxing to thrilling. Marvel at majestic waterfalls and explore nature’s other spectacles from birds to plants before enjoying a magical fireworks show. How can you get the most out of popular attractions? Book conveniently located lodgings that keep you close to the action. 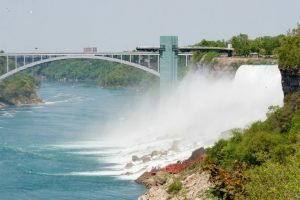 Most hotels in Niagara Falls, Canada offer accommodations for suit singles, couples, and families. You’ll appreciate easy access to a wide variety of adventure, entertainment, and dining possibilities. The top 10 hotels in Niagara Falls, Canada offer comfortable accommodations, preferred amenities, and attentive teams. Choose housing with refrigerators, microwaves, fireplaces, Wi-Fi, private balconies, beaches, indoor and/or outdoor swimming pools, hot tubs, saunas, spas, fitness centers, babysitting services, shops, and/or restaurants. Are you looking for Niagara Falls Canada hotels with historic cozy charm? Consider smaller bed and breakfasts like lovely Greystone Manor, a 1912 gem. Guest rooms with private entrances and bathrooms, mini-fridges, and wireless internet access ensure solitude among timeless elegance. Share local experiences with fellow travelers over delicious breakfasts. Want more options? Check out all 165 Niagara Falls hotels that include something for everyone at the best available rates. Envision yourself in a luxury resort with jacuzzi suites in the tourist district’s grand Fallsview high rises. Family-friendly choices range from motels and inns to campgrounds. From homey to romantic, parkway B&Bs that overlook the Niagara River are picturesque retreats. 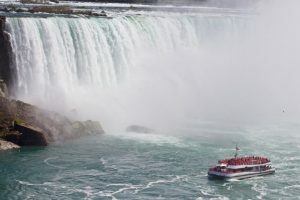 Hornblower Niagara Cruise: Canada hosts North America’s oldest attraction. Witness raging waterfalls in a 700-passenger catamaran. Departing from Niagara Gorge’s base, you’ll pass American Falls and Bridal Veils Falls, landing in Horseshoe Falls’ gushing waters. Journey Behind the Falls: Wonders await within a bedrock tunnel behind Horseshoe Falls’ impressive sheet of water. Cataract and Great Falls Portals offer amazing views of an astounding 13-story shower thundering down into a basin. Ponchos provide protection against the mist. Outside, behold the falls from observation decks. Niagara Whirlpool Aero Car: Enjoy the excitement of soaring over Niagara’s whirlpool in a classic cable car. This round trip invites 35 sightseers to watch the river turning counter-clockwise with fantastic panoramas of Niagara’s roaring rapids and gorge. White Water Walk: View the wild white-water stretch on this unique boardwalk. Observation decks will help you survey Niagara River’s raging rapids. Due to the treacherous waters’ speed and tall waves, the footpath is the ideal way to experience this boat-free zone. Cave of the Winds: Descend 175 feet downward in an elevator into Niagara Gorge. Standing close to Bridal Veil Falls in a poncho on the Hurricane Deck, you’ll feel a windy spray resembling a massive storm. Visit the World Changed Here Pavilion to discover how an adventurer harnessing the falls’ power created alternating current. Bird Kingdom: Observe exotic feathered or scaly creatures at this large world-class aviary. Vibrant birds like African grey parrots, blue crowned pigeons, budgerigars, and eastern rosellas fly freely around the rainforest. Stop at the captivating Animal Encounters area to hold and take photos with macaws, iguanas, boas, and more. Watch the Night Jungle’s fascinating nocturnal residents including bats, owls, and reptiles. Butterfly Conservatory: Admire 2000-plus vivid butterflies in this lush, magical wonderland. Visit the conservatory’s Emergence Window to witness the miracle of caterpillars turning into butterflies. See various inhabitants feeding and take pictures throughout this paradise. Aquarium of Niagara: Outside, marine life artist Robert Wyland’s life-size whale mural offers a peek at the underwater scenes awaiting you inside. Enjoy 30 exhibits featuring 200 aquatic species like sea lions and seahorses plus penguin, tidal pool, and shark feeds. Displays represent ecosystems from coral reefs to the Great Lakes. Educational opportunities encourage conservation. Niagara Glen Nature Reserve: Escape to this peaceful nature retreat that overlooks Niagara Whirlpool’s stunning rapids. While exploring Niagara Gorge paths winding through this pristine forest region, you’ll spot native plants and animals. Follow designated Niagara Glen trails only, leaving nothing but footprints behind. Clifton Hill: Kids love this popular amusement park’s six big attractions including Dinosaur Adventure Golf, Movieland Wax Museum, and Zombie Attack. For incredible Niagara Falls views, take a ride on the giant SkyWheel. Niagara Falls Fireworks Show: This memorable display explodes across the dark sky, illuminating magnificent Niagara Falls Friday nights. Double check schedules online since weather conditions can cause last-minute changes. With many different activity and hotel choices, a trip to Niagara Falls is always a good idea. Now is a better time than ever to see deals for hotels in Niagara Falls, Canada. Plan your vacation today!